Almost every architect has horror stories about the Client from Hell, the unpleasant entity whose capriciousness or bad taste leaves the designer fuming. Arguably, though, the hardest client to design for is yourself. San Francisco’s NICOLEHOLLIS studio took on the tough task of designing an office for itself, in an old loft in the city’s South of Market (SoMa) neighborhood. 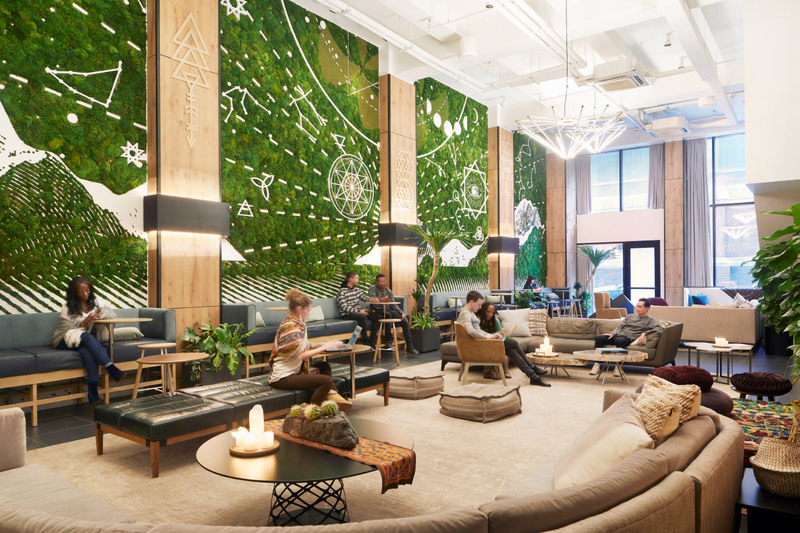 Whereas it formerly ran its business in an old machine shop, the studio now operates out of a 5,000-square-foot single-floor office in a building that could command a corner in SoHo or Tribeca. 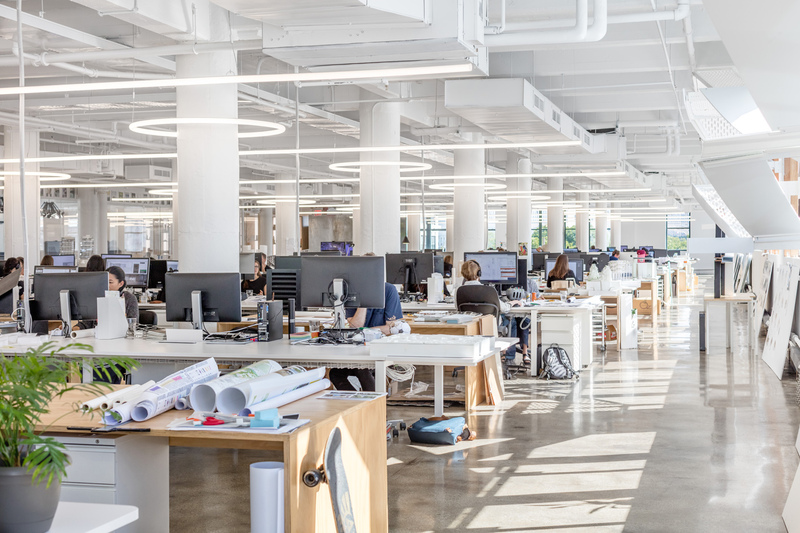 The build-out, led by Hollis, takes advantage of “terrific” natural light and gorgeous views across the city to offer its designers (and visiting clients) an elegant, high-contrast office that’s both a lab for deep focus and a collaborative, social workspace. The office is a study in black, white, and light. 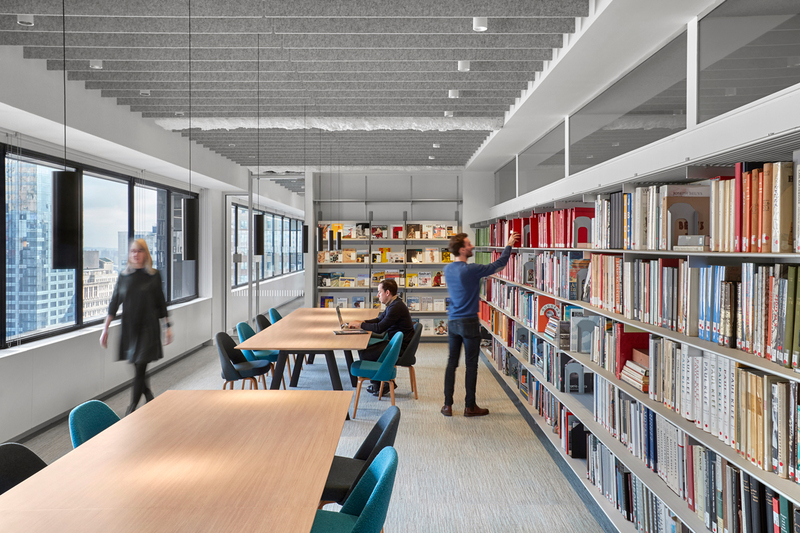 Working with Inna Baranova, the studio director for interior architecture, and Adele Cunningham, the studio director for residential projects, Hollis crafted custom white central workstations with built-in standing desks that are both naturally lit and illuminated with FontanaArte’s Avico pendants. 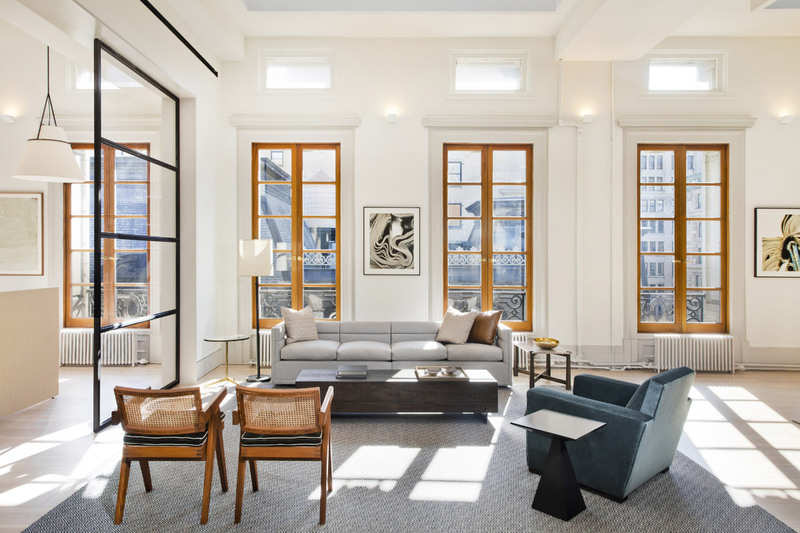 Although it’s often tough for light to reach the center of the floor plate in converted 19th-century factory buildings, NICOLEHOLLIS had the opposite problem—windows on all four sides. Hollis said she and her team used window treatments and UV filters on all the window panes. Conference rooms occupy prime window real estate, because clients like to soak up the views, she added. NICOLEHOLLIS carefully considered employee areas, too. Office kitchens are often drab afterthought spaces, decorated only with break-room signage and passive-aggressive Post-it notes. Hollis designed an island that encourages her staff to socialize, and there’s a large table for family style lunches. 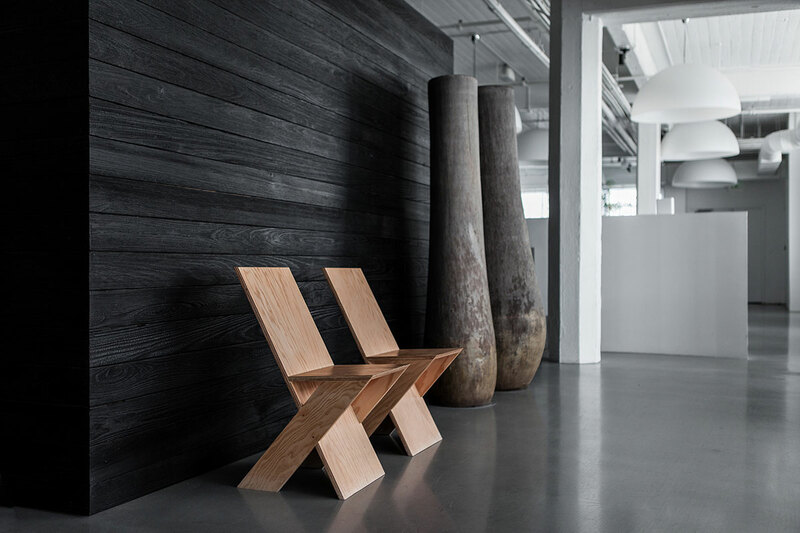 Back at work, the materials library is divided by boards charred using shou sugi ban, a Japanese technique that burns wood to preserve it. 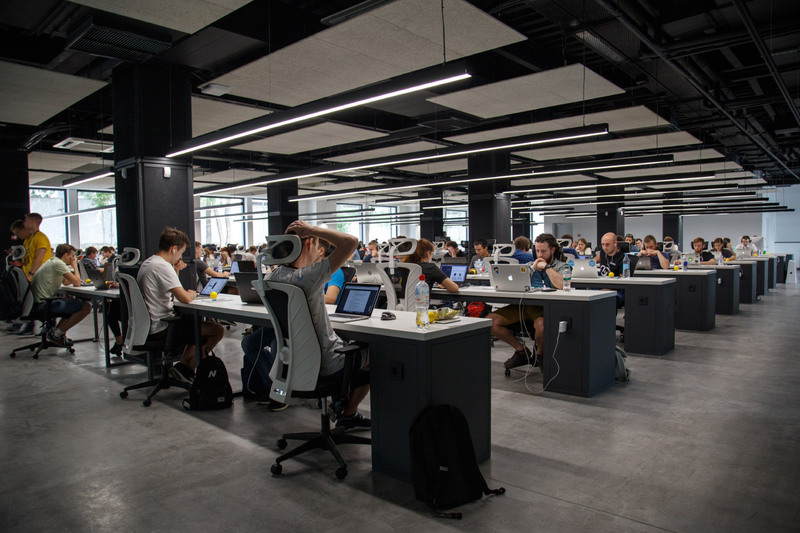 Throughout, the office is sandwiched by gray poured-concrete floors and a white concrete ceiling. “The white allows us to clear our heads and take a fresh look at our work,” Hollis said in an email. “Black is grounding and adds depth and shadow in contrast to bright light.” Hollis’s custom piece near the entrance exemplifies the NICOLEHOLLIS approach. 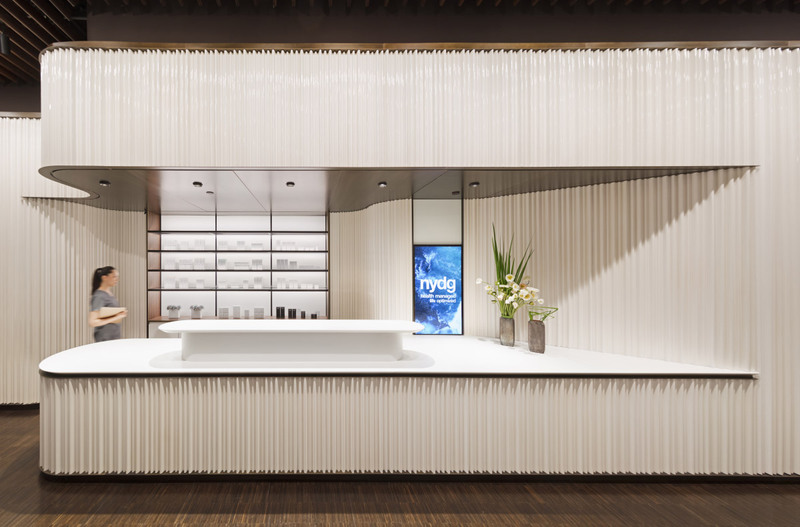 “The reception desk is my ode to Donald Judd,” she said. “I take a lot of my cues from fine art. I love Judd’s work—its spatiality and relationship to context. The desk is also mirror polished brass and makes a strong statement about the studio’s ties to materiality and craftsmanship.” The studio works mostly in California, on residential and commercial projects, including plenty of offices. 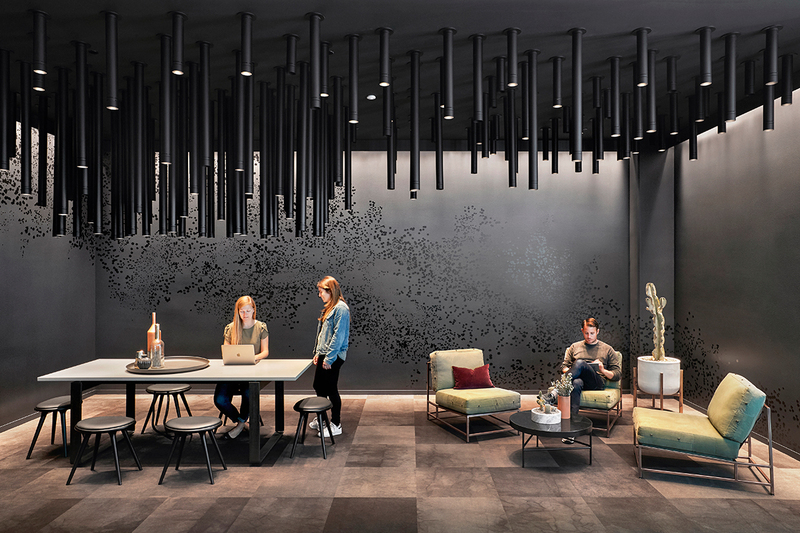 Hollis said the firm recently completed a Silicon Valley office, and it designed an office for HALL Wines, in the Napa Valley. But there’s another office project closer to home. NICOLEHOLLIS now boasts more than 50 employees, so Hollis and her team are looking to expand the space they’re in now with individual work spaces, as well as more conference rooms, materials libraries, and dining areas. When Beinfield Architecture set out to create a new headquarters for travel search engine Kayak, it turned out that client and architect both had movement on the brain. 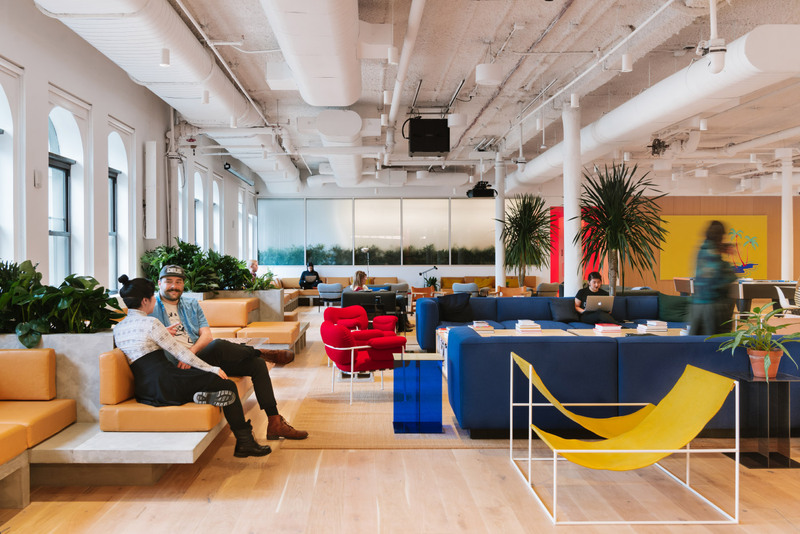 Bruce Beinfield, principal at Beinfield Architecture PC, explained that Kayak wanted to entice young, educated professionals from New York City to come out and work for the company in Stamford, Connecticut. The “reverse-commute” would be worth making, the team postulated, if Kayak could deliver a cool place to work. The resulting headquarters is located just off a Metro-North Railroad stop in a formerly abandoned police station designed by Yale University architect James Gamble Rogers. 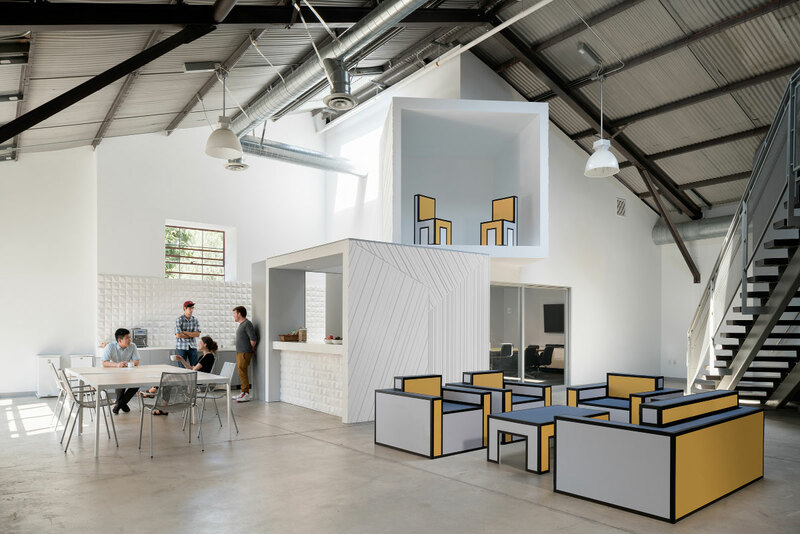 “We wanted to celebrate the raw materials of the existing structure and let those elements energize the space,” Beinfield said, adding that the existing building was largely untouched during the renovation as a result. The long, narrow structure is wrapped in neo-Gothic-style ornamentation, its brick walls studded with grand, punched openings. The double-height main floor—partially subdivided during the renovation—is topped by a concrete roof supported by dramatic, open-web steel trusses. These elements frame the soaring space and are referenced throughout the project as visual and symbolic anchors. 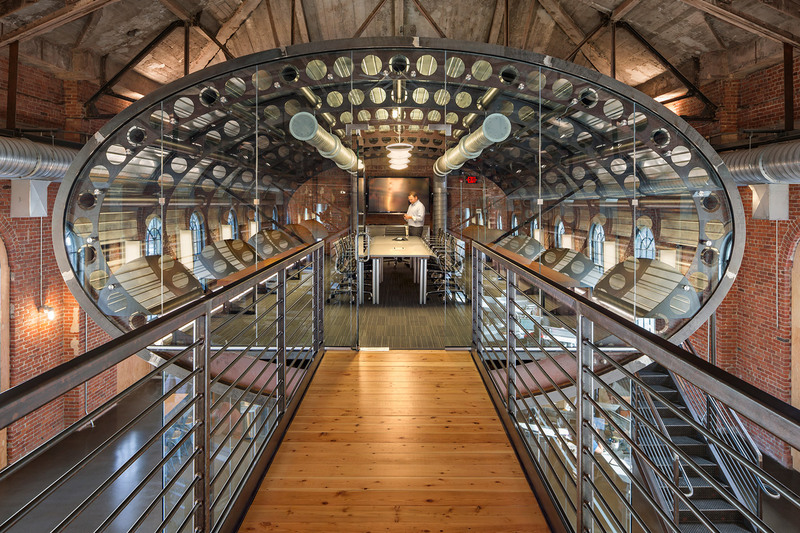 Kayak envisioned the patinaed headquarters containing not only top-notch collaborative offices, but also an awesome accent piece: a full-scale section of a vintage airplane fuselage that would symbolize the company’s airline-travel focus. The historic building’s nature precluded altering the structure physically, so the 20-by-30-foot fuselage couldn’t be dropped in as was originally planned. Instead, Beinfield constructed a replica within the building from new components. The elliptical fuselage is installed on the far side of the main level and is used as a large meeting room and workroom. One end of the cabin is sheathed in glass, while the interior surfaces all around have been peeled away to reveal a ribbed structure made from castellated beams. A catwalk connects the aircraft body to the rest of the space, reaching a smaller mezzanine meeting room and a circulation core beyond. 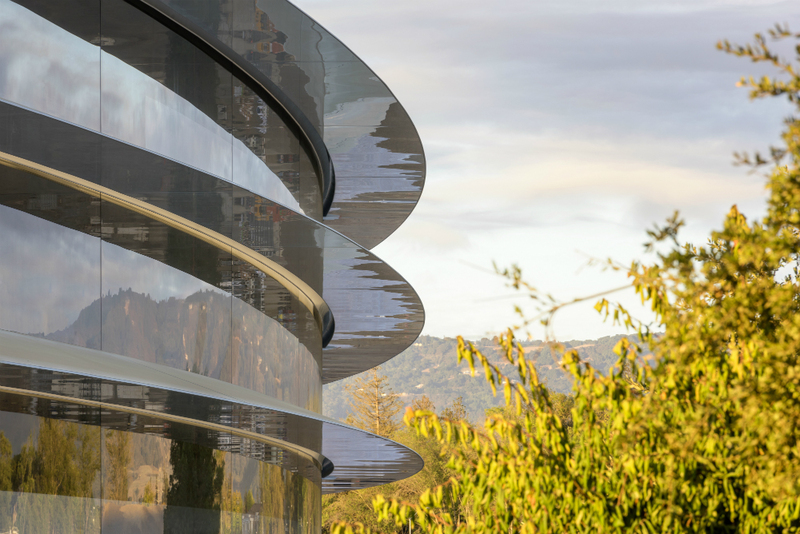 The sleek fuselage is clad in reflective aluminum along its belly, which on the floor below creates a catenary-shaped ceiling for another glass-enclosed meeting room. Distinct offices and open-air seating areas populate the main level beyond. Large semicircular lamps hang from the rafters above, while lengths of ductwork and piping zoom in and out of workspaces—like travelers making connections at a busy airport.